My name is Alessia and I live in the wonderful city of Siena, with my family: my husband and two children. One of my favorite activities is gardening, I have got a vegetable garden and I prefer preparing food by using what I produced in there or anyway by using the local products as oil, olives, cheese, honey, wine, etc… I really enjoy cooking for my children and organizing parties for them and their friends: I love hosting people. I belong to a group responsible to arrange activities with children of “Bruco” which is 1 of the 17 “Contrade” of the Palio, the most famous Italian horses race. I love the Palio and I believe that one of the best moments to visit Siena is during the days of the race. Staying in Siena and viewing the city and citizens during this time will make visitors aware of the passion, the culture, the story, the mysticism and the love for the horses. I love animals especially dogs and, of course, horses. I hope to take soon a dog from the doghouse and maybe, some cats. I love black cats. Together with my husband and my children we like travelling all around the world and meeting with new people. I love people and it is fantastic to have the chance to talk with them and understand different points of view. 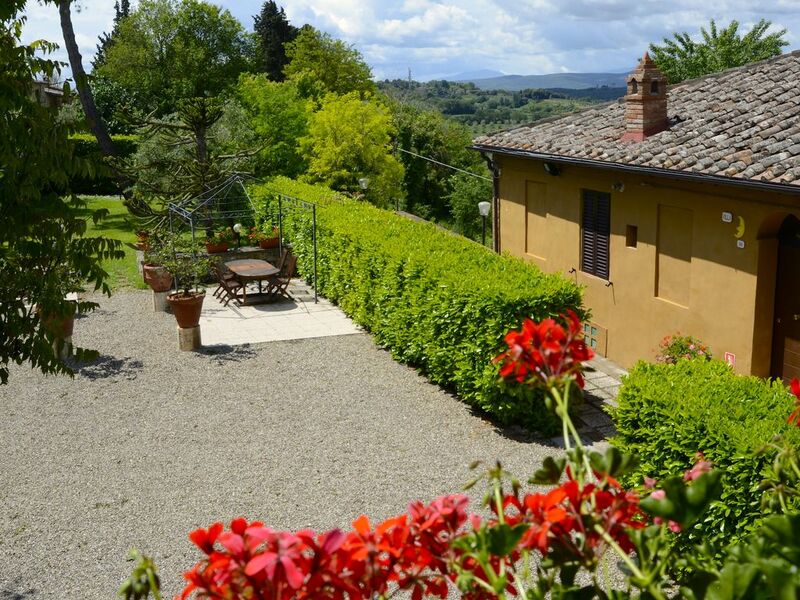 I own this very beautiful house nearby the centre of Siena but set in the wonderful countryside with a little and safe swimming pool where you can relax enjoing the landscape, breathing the scent of the nature and listening the silence. I hope to meet you and your family and, why not, to have you as new friend in the world. If you have any question, please do not hesitate to contact me. The property is in one of the most beautiful areas of Siena in the authentic Tuscan countryside, it is located on a hill from which you can see the old town surrounded by hills and the vines and fields of olive trees. The house also has the convenience of being close to the Cavour street where there are restaurants, shops, pharmacies where there are bus stops to the city center. In this area and close to the villas is also my home where I wanted to live for a long time. After that my dream came true and I bought this property I decided to share the beauty of the place with my guests. The beauty of living in the Tuscan countryside near the city. We can book for you a typical Tuscan dinner in the farm restaurant near the villa. Or we can provide a welcome service with some groceries purchased for you to find at your arrival. A cleaning service during the stay is available on request. And it's possible to rent bikes or have a guide to explore the hills on mountain bikes. To reach the city center you can use bus and taxi. There is a bus stop just 700 meters away from the house. The bus n. 1 bus in 10 minutes will leave you in Piazza della Posta, from there to Piazza del Campo is a nice walk through the main street. The center of Siena is a pedestrian zone. The bus stops every 30 minutes. We had a great time staying at Villa Luna. It's an old house in traditional Tuscan style, very homey and cozy. The location is great, just outside of central Siena. We walked in every day for dinner and in case you prefer to go by car a cab wouldn't cost you much. Alessia was a dream to deal with, extremely helpful and flexible. We had a slight problem with the pool one day and she sent someone right away. The only thing to be aware of is that the villas are not very private, you'll share yard/patio with the other villa and the pool is shared between the villas and the apartments (which makes it a bit crowded at times). The pool was also a bit dirty at times, with leaves and bugs blowing/falling in, but not a major problem. Overall we loved our stay and can really recommend this beautiful house to others wanting to explore Tuscany. This is a beautiful and quiet place that is still close to the city center. We were traveling with my parents, my sister, and my children and there was plenty of room for everyone. The kids loved the pool and olive groves and the adults loved the quiet and the view. satisfactory accomodation, but not the best. The wifi was not on twice. The gate was locked on our last day and we could not get out or in. The villa is a long way out of Siena, so a car is necessary. We were not shown how to use the washing machine and we had to call Franchesco to come and show us. Alessia’s English is poor and we had trouble communicating with her. The refrigerator smelled terrible when we arrived and although we cleaned it out, the smell was still there. There are no ice cube trays and we could not buy ice anywhere. Spacious villa with wonderful views. This is a beautiful former convent that is very spacious. 4 bedrooms and 3 baths! The showers are wonderful. It is about a 45 minute walk to the center of Siena, but it isn't a difficult one. Wonderful family stay - 6 adults, 3 children, 2 infants - in a cozy, comfortable setting! Alice met us as agreed and proceeded to show us around Villa Sole. although the house has very good large bedrooms with comfortable beds and a large dining room and outside area, it is let down by a very small and inadequate kitchen. the pictures are not clear between Villa Sole and Villa Luna with Villa Luna having a lovely big well fitted kitchen and bedrooms with bathrooms en suite so you have to be very careful to make sure when you are booking you know which house it is as we were disappointed with the kitchen especially when shown the other house by the guests staying there. the kitchen in Villa Sole is down a dark flight of steps and is crammed with a table and 4 chairs cooker fridge freezer and washing machine. although there were 5 gas burners the large one in the middle did not work and this and other things were not checked by the owners before letti g the property. we had to request wine glasses (there were only 4 and in Italy!) there were not enough knives either BUT Alessia did immediately respond to this and provided additional glasses on the Monday(we arrived on the Saturday). None of the bedrooms are en suite (like Villa Luna) and one of the bathrooms on the first floor where all the bedrooms are does not have a shower so there were 8 of us sharing 2 showers one of which is on the ground floor down the wooden spiral stairs. all of this was a shame as the location of the house is great, and Alice who seems to do all the managing of the properties was lovely and helpful. There is a shared pool supposed to be just for the 3 villas but other people renting the apartment seem to be able to use it so if all the guests in the villa and the apartments wanted it at the same time there would be no room. so this is why I gave it just 3 stars as there was some disappointment but otherwise we had a great week there. The villas are in the countryside, but very close to the city of Siena that you can reach on foot, the complex is located on the Via Francigena, which is an ancient route, traversed by merchants and pilgrims to join Italy to Europe and to Rome. There are so many paths for walking and hiking, you can also make cycling tours or horseback. To reach the city center you can use bus and taxi. There is a bus stop just 700 meters away from the house. The n.1 bus in 10 minutes will leave you in Piazza della Posta, from there to Piazza del Campo is a nice walk through the main street. The center of Siena is a pedestrian zone. The bus stops every 30 minutes. The house is located 2.7 km from the historic Piazza del Campo and the Cathedral of Siena.There are restaurants, supermarkets and pharmacy nearby (1.3 km). SIena area is central between the Chianti, where you can do wine tours, and the Val d'Orcia with its beautiful scenery old churches. A beautiful golf course is only 15 minutes away from the house, many riding track are in the area, and you can make cycling and mountain biking with breathtaking views. The price includes linen, towels, pool towels, wireless internet access. The remaining balance, the security deposit of 200 Euro (which will be returned on your departure), and Stay/Tourism Tax (charged 2,50 Euro per person per night up to 6 nights - does not apply to children under 12 years old) are due in cash [EURO] on arrival.